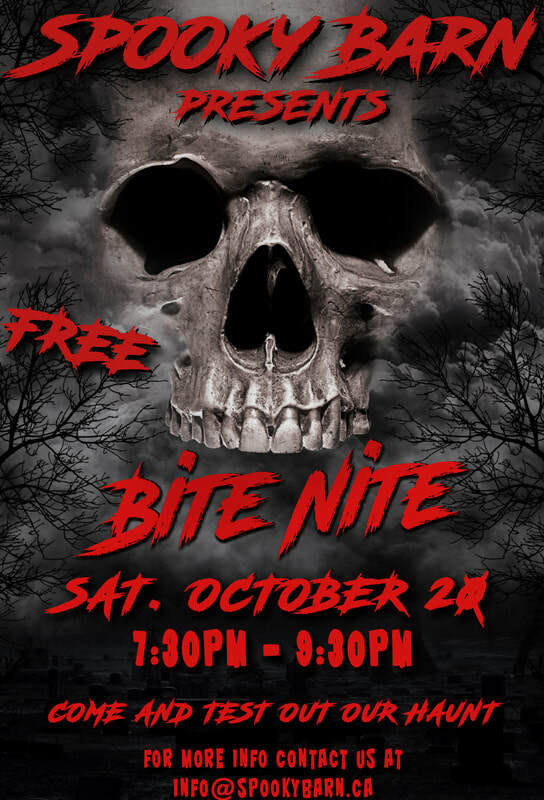 ​ Assistant Coach Gillian Hayek is inviting the team (and their families) to her haunted house's "Bite Nite" for windup! Spooky Barn is a haunted attraction just outside of Birds Hill Park that has been around perfecting the art of scaring since 2008! Saturday October 20th, starting at 7:30pm... no set end time, whenever you get tired or decide you've had enough fright for the night. Information about our haunt (including the address and directions) can be easily found on this website. We will have a separate area for the team outside at a fire pit (we will section off a corner indoors if it is rainy or miserable outside). That way if you do not want to participate in the haunt, you can stay in the team area. Coach Brian and Coach Gillian are going to supply hot dogs, buns, condiments, and drinks. If we end up having to stay indoors, plenty of snacks will be provided by the Hayeks for the team. ​Please bring chairs for yourselves! BITE NITE is by invitation only and there will be plenty of people coming through, not just the team. The purpose behind it is to get our volunteers in the groove of things and work out any flaws we may have missed, that's why it is free for the night. Feedback is encouraged and always taken seriously.